The myth of King Arthur and the Knights of the Round Table is a story that has intrigued generations. Excalibur, aka “The Sword in the Stone,” and Merlin the magician are part of this fascinating legend. Now, The Kid who would be Kingadds to that with an amazing adventure of some perfectly normal kids tasked with the job of saving the world. Alex (Louis Ashbourne Serkis) is just an average kid. He and his best friend Bedders (Dean Chaumoo) are considered the geeks of the school and are constantly bullied by Lance (Tom Taylor) and Kaye (Rhianna Dorris). Then one day, while running away from the duo, Alex falls into a pit and discovers a sword…in a stone. This couldn’t be Excalibur, could it? The legend says that the evil Morgana (Rebecca Ferguson) will one day rise up and control the world, when the sword is dislodged. Well, guess what. Alex now has the sword, and Merlin (Angus Imrie) arrives to help him. It is now up to Alex to save the downward spiral of the world. He lets Bedders in on what is happening, and then decides he needs more help. So Lance and Kaye join them and the four are now off on a spectacular journey to kill Morgana once and for all, and keep the world from ending. Yes, they must save the world, but they have Excalibur and some special magic to help them. Patrick Stewart appears in a few scenes as the older Merlin, however it is the young Merlin who accompanies the foursome on their dangerous journey. This is a magical and adventurous story. Kids will definitely enjoy watching the legend play out in modern times, and adults will be intrigued by the story as well as seeing Patrick Stewart on screen as the legendary Merlin. There are plenty of bonus features included on the discs in the combo pack. First are several deleted scenes. Then there are some fascinating behind-the-scenes featurettes about the origin of the story by writer/director Joe Cornish who has always been intrigued by the legend of Arthur. The viewers are introduced to the young knights and learn how they trained for their battle scenes. There is an interesting featurette about the two actors who play Merlin, and one featurette about Rebecca Ferguson and her evil Morgana character. 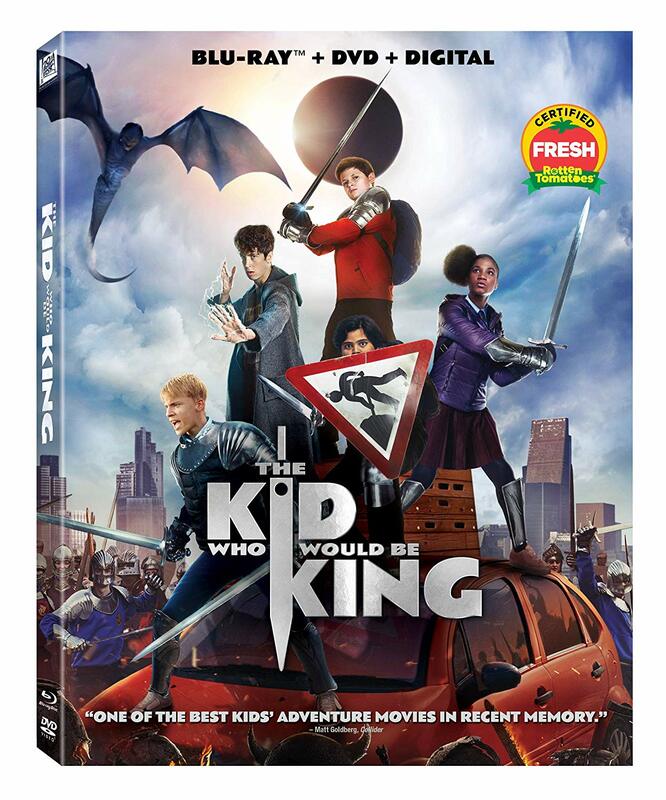 The wardrobe and makeup tests and a look at some of the magic in the film are noteworthy and especially intriguing for young viewers.The Kid who would be Kingis a fun adventure adding a chapter to the legend of King Arthur. It is rated PG for fantasy action violence, scary images, thematic elements including some bullying, and language. This is a fun film showing how some ordinary kids, bullies and nerds, join forces and ultimately learn about teamwork and friendship.